A PDF advertising this event can be found here. California, along with most of the western states, faces the worst collapse of food production and population in our nation’s history—and it is not the drought. It is the Nazi policies of rabid free-market, Wall Street stealing, tied with the environmentalists’ depopulation agenda which is the problem, and nothing less than a complete rejection of both of these fascist policies will enable the U.S. to survive! Join LaRouche PAC for a live national town hall meeting to discuss our emergency scientific program to end the water crisis, featuring speakers and audiences in California, Texas, and New York. 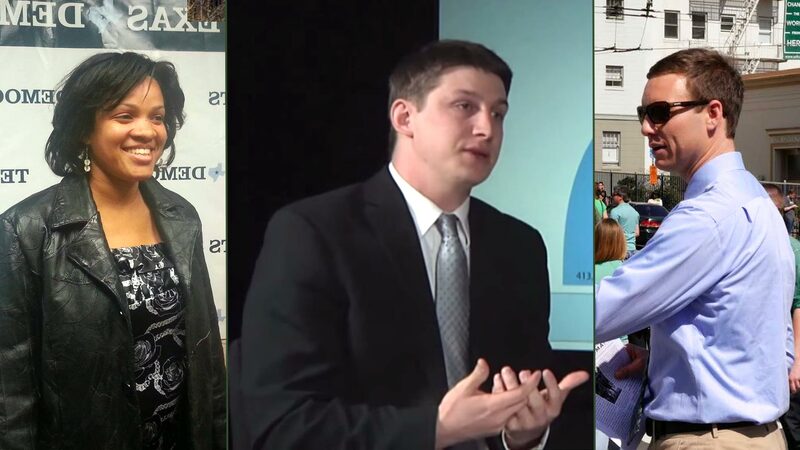 The live simulcast will feature presentations from former Democratic candidate for U.S. Senate of Texas, Kesha Rogers (left), LPAC Scientific Research leader, Benjamin Deniston, author of “New Perspectives on the Western Water Crisis” (center), and former candidate for U.S. Congress in California, Micheal Steger (right). The scientific evidence presented by Benjamin Deniston of the LaRouchePAC Scientific Research Team irrefutably demonstrates the incompetence of Jerry Brown, Barack Obama, and the rest of the zero-growth fanatics. The water exists—for California, for Texas, and for all arid regions—now we must have the political commitment to access it. Mankind is fully capable of managing and increasing the global water cycle to meet the needs for a growing population. This starts by realizing Earth’s water system is driven by solar activity and galactic cosmic radiation—a higher perspective which enables mankind to manage the water resources of our planet and atmosphere in a completely new way. Coupled with desalination and large-scale water transfer projects, we have the basis to address all of mankind’s water needs. With this commitment, the new incoming Presidency must immediately reinstate Glass-Steagall and end the tyranny of Wall Street’s slave-based system. Second, we must put an end to all laws which violate the General Welfare principle of our United States, including and especially all laws which emphasize population reduction and so-called conservation. With the restoration of the principles of Alexander Hamilton and our Constitution—a return to pro-growth, pro-science policies such as nuclear fission and fusion power, atmospheric water management, and space exploration—we will put an end to the fascist cycle of wars and destruction, and combine our efforts with those of China, Russia, and the other BRICS nations towards advancing global development. End the Nazi Occupation, Burn the Bushes and Let the Water Flow. This entry was posted in Glass Steagall, water crisis and tagged brics option, BRICS+, Bush League, California, crimes of Wall St, Glass Steagall, green fascism, green genocide, Jerry Brown, nuclear desalination, Texas, water management, western drought. Bookmark the permalink.